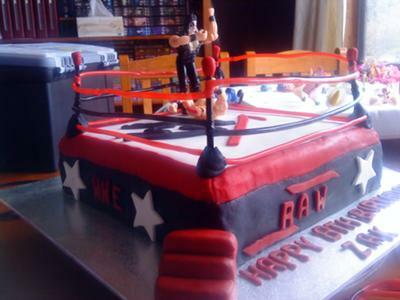 This WWE cake is two 12 inch cakes with white home made butter cream fondant. I used bought red and black. The colors are more intense then making them your self. I cut out the lettering with letter cutters and attached them with royal icing. The ropes are silly straws and the toys are just from the $2 shop. Hope you like this cake. I love the stars...I'm very partial to stars. The whole thing just turned out wonderful!